First, without your help and support we would not have been able to send the 20 women who have been victims of violence to Outward Bound Canada’s Women of Courage program. Thank you for making it happen. Thank you for your generosity and phenomenal support! I’ve been back in Toronto for a little while now…and the first week felt like a haze. The reality is now slowly sinking in. This journey is finished. People are already asking “what is next?” And, I am very far from being able to answer this question. Not yet. Let me bask in the echo of the Himalayas for a little while longer. But, as quickly as I’ve forgotten the pain of climbing Mt. Kilimanjaro, as quickly I will succumb to a new adventure, I think. I am a bit of an adrenaline junkie, and pushing my limits while contributing to a great cause is something that I have not left on Everest. As I was walking, trying to enjoy breathtaking scenery and not stumble at the same time, I had time to think… a rare gift, as many of you know. And although there were many moments where my thoughts were limited to “where do I put my foot next?”, I do have a few insights I hope are worth sharing. These insights have, in my mind, clear parallels with the challenges and difficult situations we face in the corporate world. You tell me if I’ve got it right! This is not a trek. It is an ordeal that needs to be taken seriously. No, not a technical climb, but still a physical challenge. To meet the challenge I needed to overcome a bit of fear. The closer I came to the trek, the more real my insecurity was – “Will I be strong enough?”, “Will the Kili struggle be repeated?”, “Will the altitude win this time?” These are just some of the questions I needed to answer. My preparation was, therefore, not only physical, but also emotional and mental. And, I needed to draw into my personal power to stay true, confident, and succeed. I am convinced that my sober confrontation of this fear prior to the trek contributed to my truer commitment and ability to face the demands of each day. The second day of the trek we climbed close to 350 stories high, to a place called Namche Bazaar. The elevation and the degree of the slope were phenomenally difficult for me. There was a moment when my heart sank. Frustrated, I questioned my ability to continue at the very beginning of the trip. What helped me was a leader, who reminded me to stay positive and steady. Realistic as to the pace that worked for me (whilst many others carried on), and authentically supportive in expressing his belief that I could do it. His encouragement and pragmatic attitude helped me normalize my mini-crisis and pull myself together. The doubt never returned afterwards. The days that followed were easier because I only had to deal with the physical strains. Throughout the trek we saw many people struggling with their own issues. What helped was the intuitive approach to giving people enough individual space, and providing team support and climate. Empathy and respect helped tremendously to achieve success. 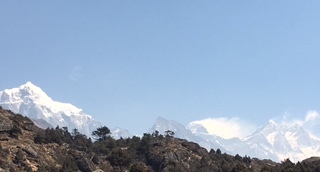 This was evident with many small gestures, such as helping each other reach the bottle of water, and larger issues, such as cheering for a trekker who had to decline climbing the Island Peak because of acute altitude sickness. We were there for each other. Never explicitly stated. Always understood and unquestioned. The trust amongst the trekkers was essential and established very early on. Our idiosyncrasies, personality traits, and differences were difficult to hide. Under stress a “true you” generally comes out. Intentions were not doubted. Behaviours that contributed to tension were addressed quickly. Conflict and tension was dealt with thoughtfully, and often with disarming humor. At some points… we laughed a lot! Simply put – successfully facing adversity or challenge demands the courage to be vulnerable, the humility to accept help, and the awareness of, and gratitude for, not doing it alone. Trust is the fundamental element that makes it all possible. If you haven’t yet, I urge you to try it. These few points really helped to deal with tough moments, and kept me going. I believe these kept the team going, to stay on course, persevere, and truly enjoy the entire experience no matter how rough it gets.